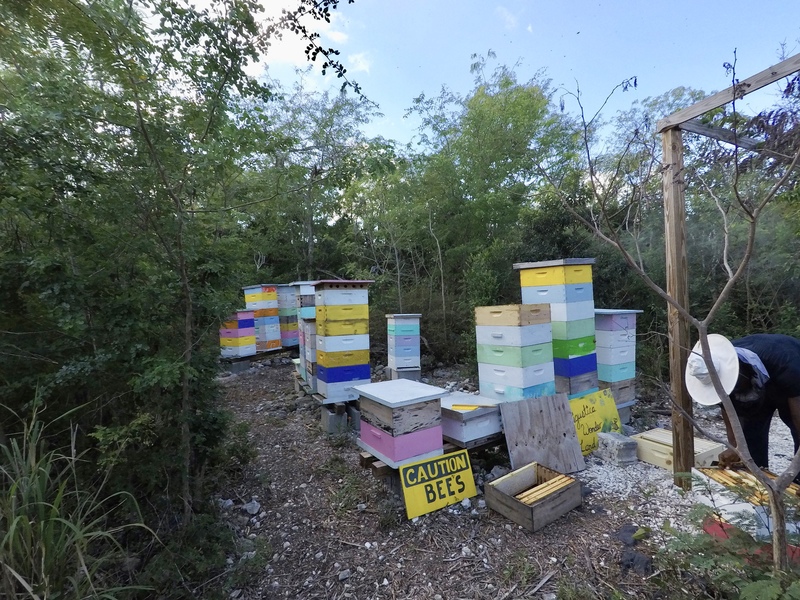 We have a honey marketing facility here is Exuma. So next time you are looking for that unique gift to take home, why not buy a jar of 100% natural honey from Exuma. I just spent a fascinating day at the headquarters where BJ spent the morning showing us around and answering our many questions. 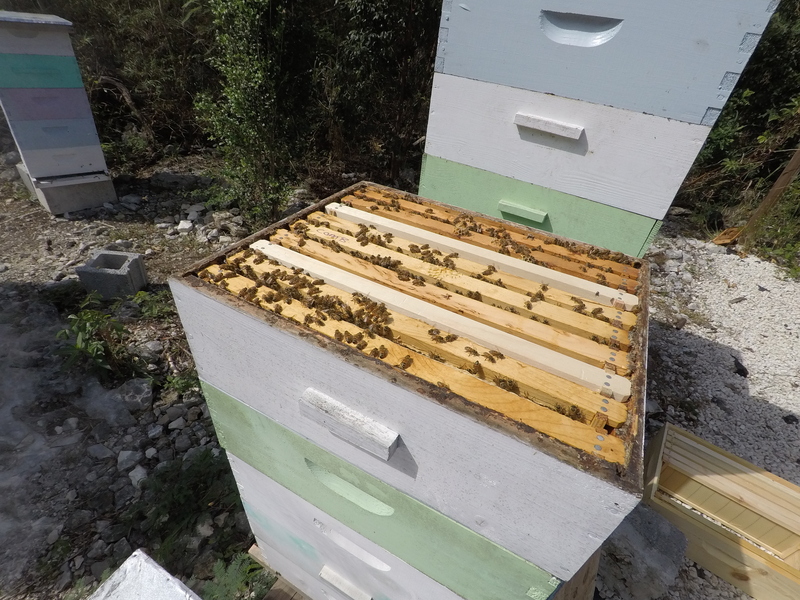 They have more than a dozen hives and as the many local plants and trees come into bloom, so the pace of activity at the production site speeds up, this time of year being their busiest. 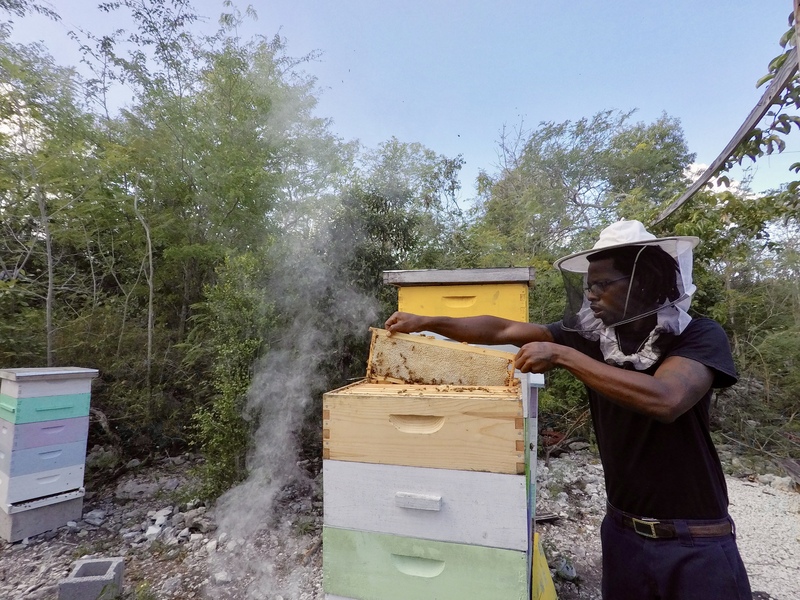 We watched as BJ sprayed a hive with smoke to calm the bees, although we were assured that this type of bee is favored because of its lack of aggression. Then slowly and carefully he removed the lid exposing the top box. Another puff of smoke and he starts to very carefully remove one of the 9 panels the spanned the box. On the panel were maybe a thousand bees. BJ gave a sharp shake and the bees fell off or flew away. Then that panel was put in a separate box to be processed and a new clean panel put in its place. There is about half inch gap between the panels and the foraging bees bring the pollen back to the hive entrance at the base of the stack of boxes. The pollen is then transferred to a worker bee that makes its way up the gap through the stack and the produce is put into the honeycomb and sealed with bees wax. The collection process was repeated for the remaining panels until we had a box with 9 new panels inside, ready to be placed back on the stack when we had gone through some of the lower panels. All this was done without gloves, just a beekeepers protective hat. It was obvious that the beekeeper had to be confidant, move slowly and carefully, especially when rebuilding the hive as he lowered each box back in position taking great care not to crush any bees. The predominant tree that is currently in bloom is the Logwood Tree and the honey from this tree is paler and processed separately from other blossoms that occur later. Once the full panels reach the processing area. 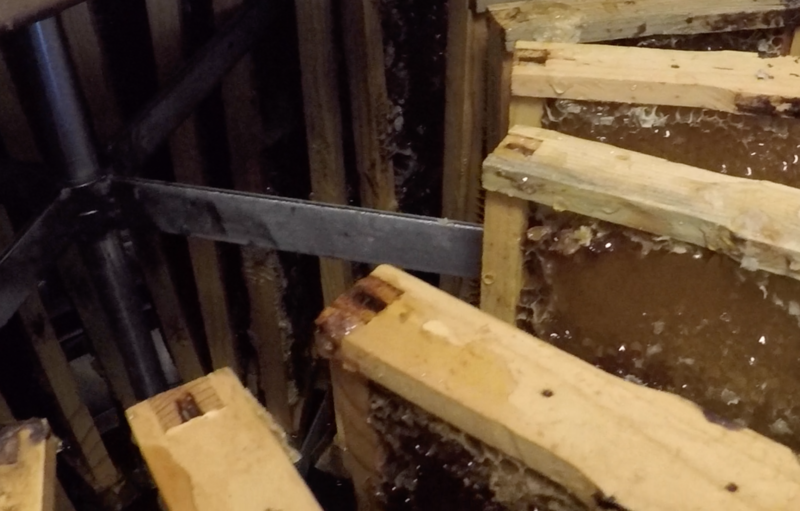 the wax is scrapped off, exposing the raw honey. The panels are then placed in a large centrifuge, spun at high speed so the honey flies out of the panel and slides down inside the drum and is filtered and bottled. In a hive there are around 1000 bees on each panel and more than 90 % are female. The male bee’s only function is to fertilize the Queen, a job that costs them their lives. There is just one queen who lays eggs for 2 to 5 years. When she is past her prime she is replaced by feeding a replacement with Royal Jelly which will become the next queen. It’s a tough life being a worker bee and their life will last around only 2 months. 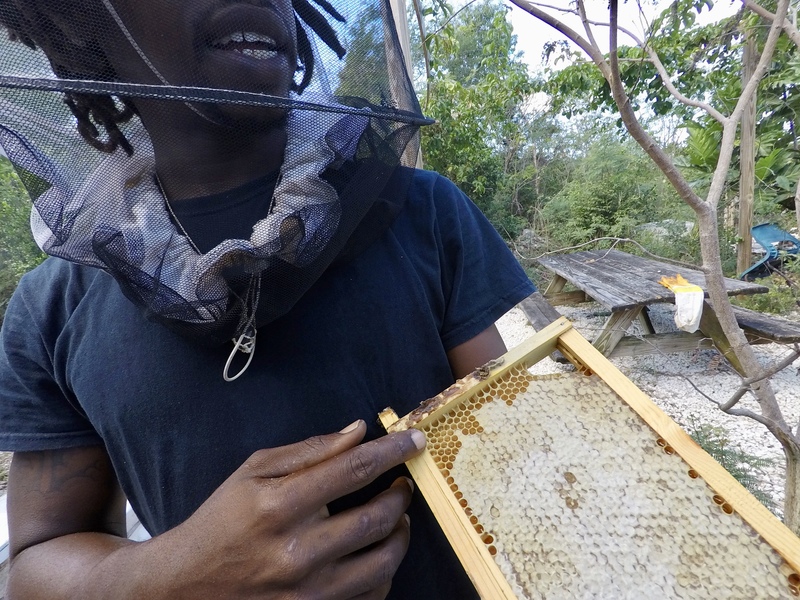 The hub of this growing industry is at the Exuma Foundation located on the Queens Highway roughly halfway between GeorgeTown and the airport, and that is where you can buy your special Exuma Honey. 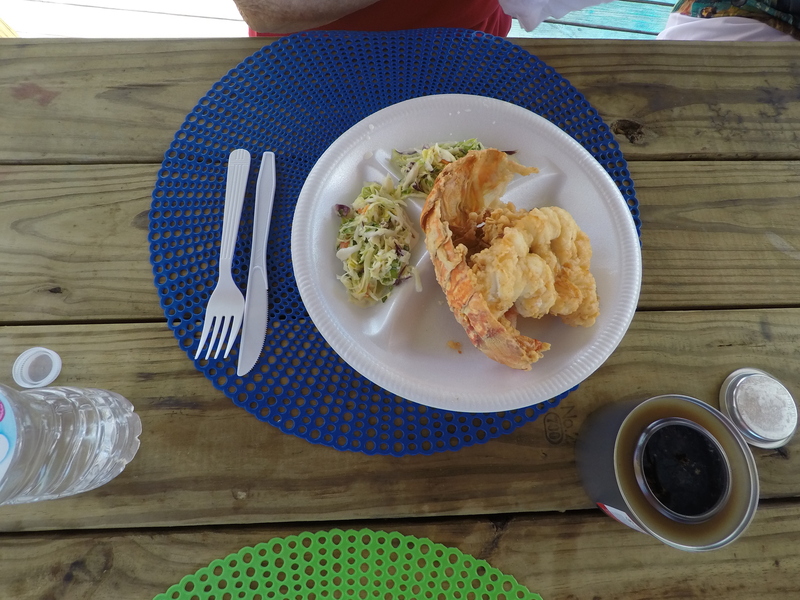 Had the pleasure, make that the delight, of a fabulous lobster lunch with newly wed guests on a beautiful February day with the temperature in the mid eighties. 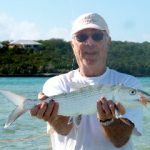 Just about every visitor to Exuma has Santanna’s Bar and Grill on their to-do list. Rated on most sites as one of, if not THE best, to sample Dee’s culinary skills. Based in Williamstown, this beachside eatery first came to fame when the Pirates Of The Caribbean film was being made. 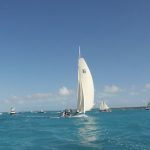 The stars, Jonny Depp, Orlando Bloom would return from their days filming on Sandy Cay, to relax and have a beer or meal at Santanna’s where their boat dropped them off. Dee still has the photo album with all the pictures and it comes out at visitors request just about every day. While my video is entitled “Feeding at Santanna’s”, it’s not going to be what you expect.!! This event takes place each day when the diners arrive, always at the same time, to check the menu of the day. Enjoy the video! 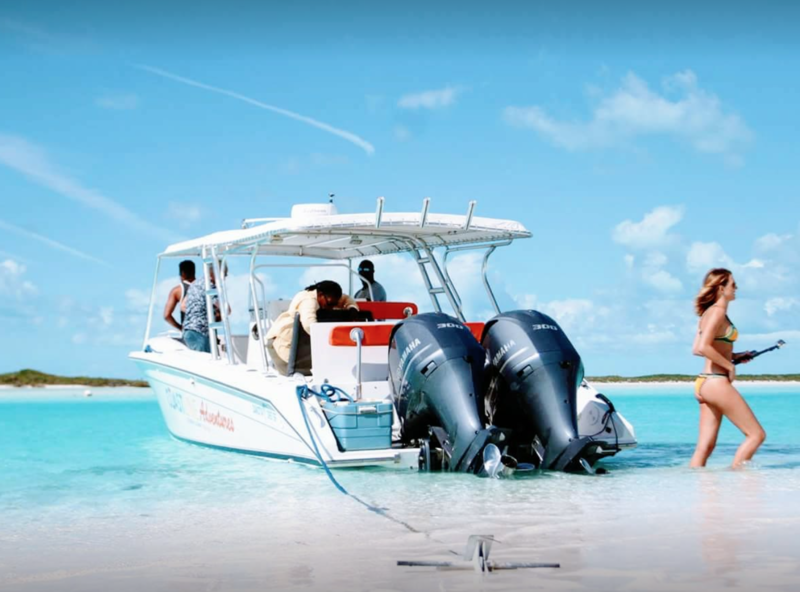 One of the delights of your vacation at Harbour View is the opportunity to search and find, and if you wish, to catch spiny lobsters in Exuma. We do have a season when you are permitted to catch lobsters. Between August and March is open season to catch spiny lobsters, subject to certain restrictions. 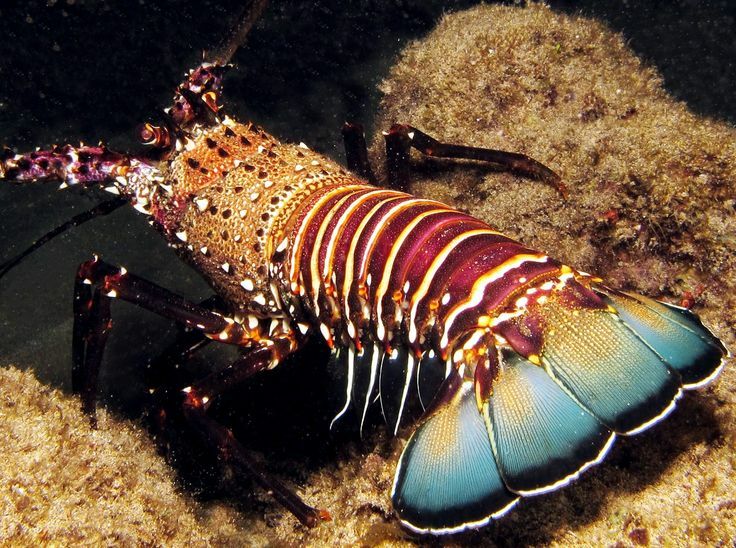 The lobster must have a minimum 6 inch tail, it must not be egg carrying ( female lobsters carry their thousands of eggs attached to the underside of their body) and you can only use a pole spear or Hawaiian sling to catch them. Lobsters can live to a ripe old age of 100 years. Like most fish stories, the largest and heaviest lobsters tend to have been caught in years past. One of the largest weighed in at over 40 pounds and was reported in a newspaper to have been sold to a restaurant for a special meal. However the public were so upset they purchased “Larry”, yes he had a name! and sent him off to an aquarium. 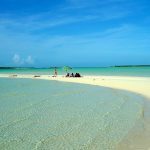 So if the idea of seeing, and maybe catching a spiney lobster, give Exuma Dive a call. They know where to take you. Lobsters are nocturnal and during the daytime, when you are looking for them, they are usually resting and hiding under ledges. Good luck ! Next time we will look at recipes for these delicious creatures. We have a new budding entrepreneur in Exuma. 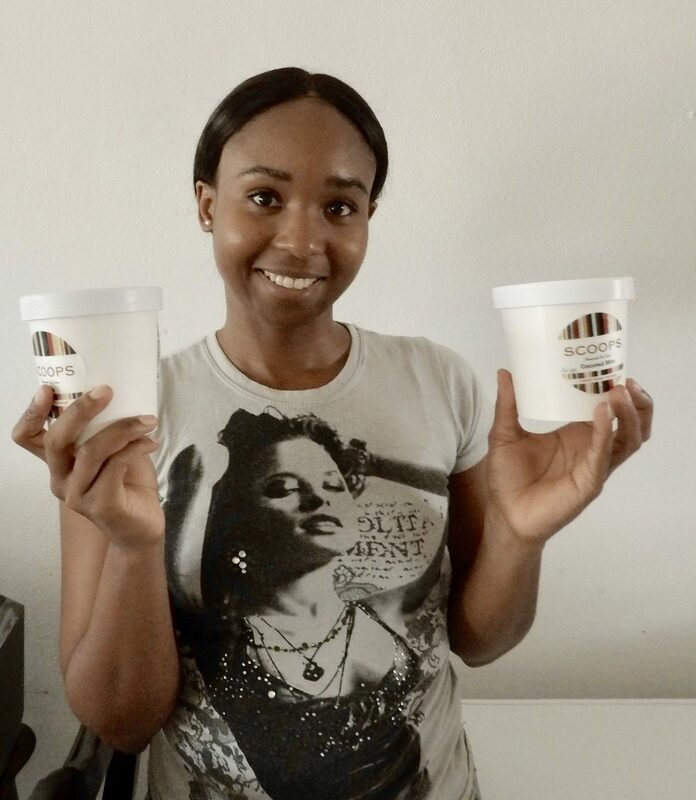 The young lady’s name is Dominique and she is working hard to start an ice cream manufacturing company under the brand name “Scoops”. I must admit that ice cream is one of my weaknesses and she will certainly get my support. You can imagine the problems of importing the Ben & Jerry, Hagen Daz products in relatively small quantities into a tropical island where temperatures can be in the high nineties. You need refrigerated trucks, refrigerated ships and the ability to protect these fragile products while transferring from on to another. Dominique has wisely decided to limit the number of outlets selling her product while she irons out the kinks in her production. So to sample her delicious blends you need to visit Prime Meats, Smitties, or Naturally Fresh. By the start of the next season in November she anticipates increasing her retail chain. 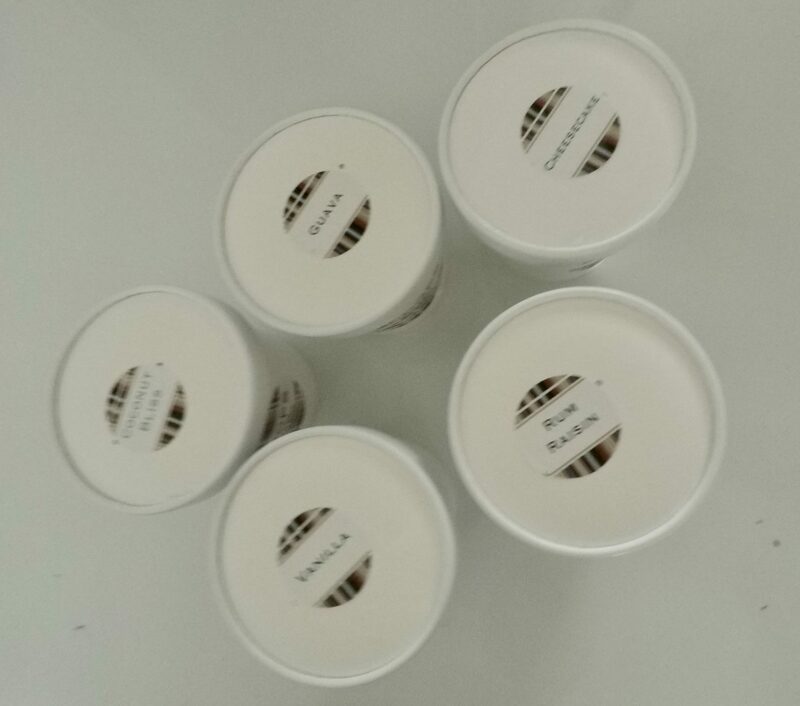 Scoops is currently available in seven flavors, Chocolate, Vanilla, Coconut, Rum Raison, Guava, Cheesecake and Caramel. My favorite is the cheesecake. Dominique, we wish you well in your new venture. And the first prize goes to…… (drum roll)… “Splash Restaurant” !! 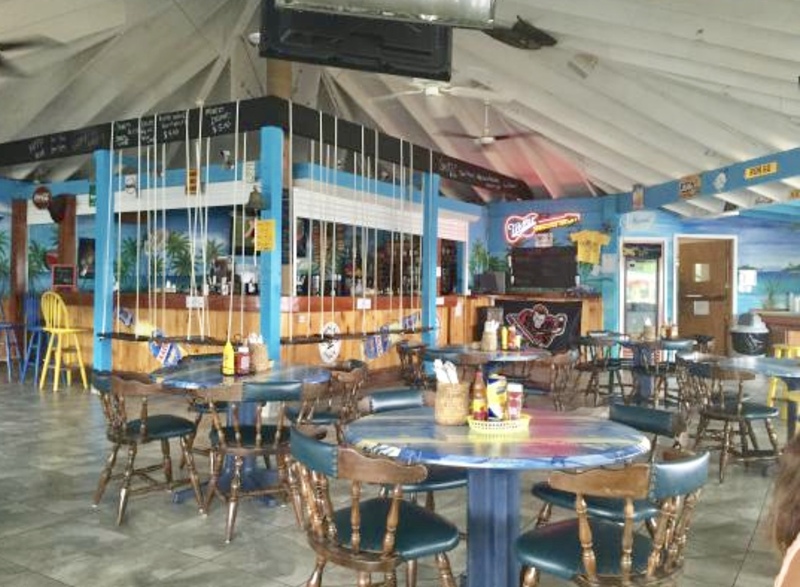 The best pizza in Exuma resides in this popular bar restaurant which offers several big screen TVs to watch your favorite sport while you pick up some stretchy cheese and get tomato paste all over your face ! Located on the edge of Elizabeth Harbour, this family run business has been around for almost twenty years and has thrived on providing home cooking at reasonable prices. Equipped with a pool table, and being right on the beach means you have the opportunity to work up an appetite before indulging in your pizza fest. One of our favorite spots when eating out in Exuma is at “Blu”. This small intimate restaurant and bar overlooks Elizabeth Harbour and their marina, so convenient to reach by road or by boat. Theirs is basic home cooking with a limited menu, which I prefer, it gives you the feeling that each dish will receive their best attention. 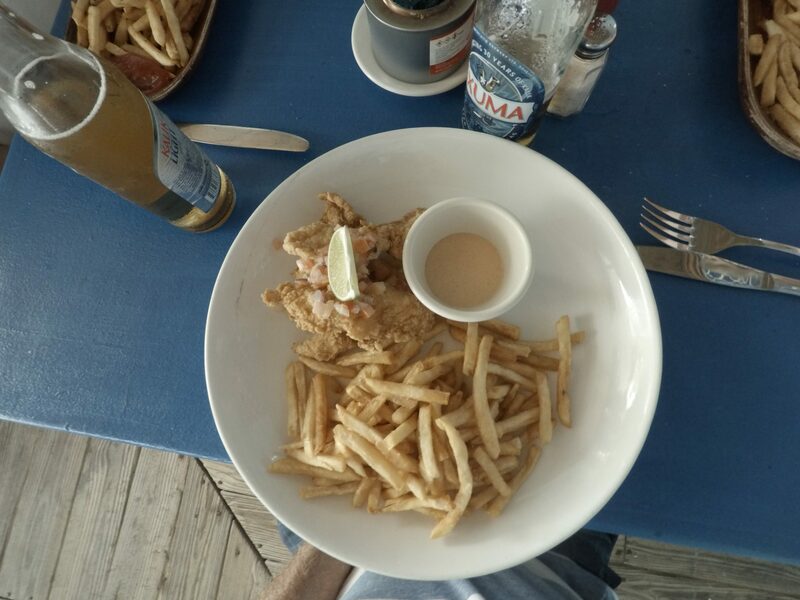 I had the fish and chips which that day was fresh grouper and it was delicious. Gail had the fish burger and a generous helping of their fries. All washed down with Kaliks and Kalik Radlers. Last time I had the conch burger and that was excellent, but since reading about the conch being an endangered species my conscience prodded me towards the grouper. Kalik is the most popular beer of The Bahamas. Brewed by Commonwealth Brewery in Nassau and distributed throughout the islands. Originally produced in 1988 from a recipe from Heineken to produce a lager with 5% alcohol. Kalik is produced as Kalik Lite, Kalik (regular), Kalik Gold (7%) and Kalik Raddler (a lime mix). The name Kalik is said to represent the sound of cow bells which traditionally is an instrument in the Junkanoo carnival parade. 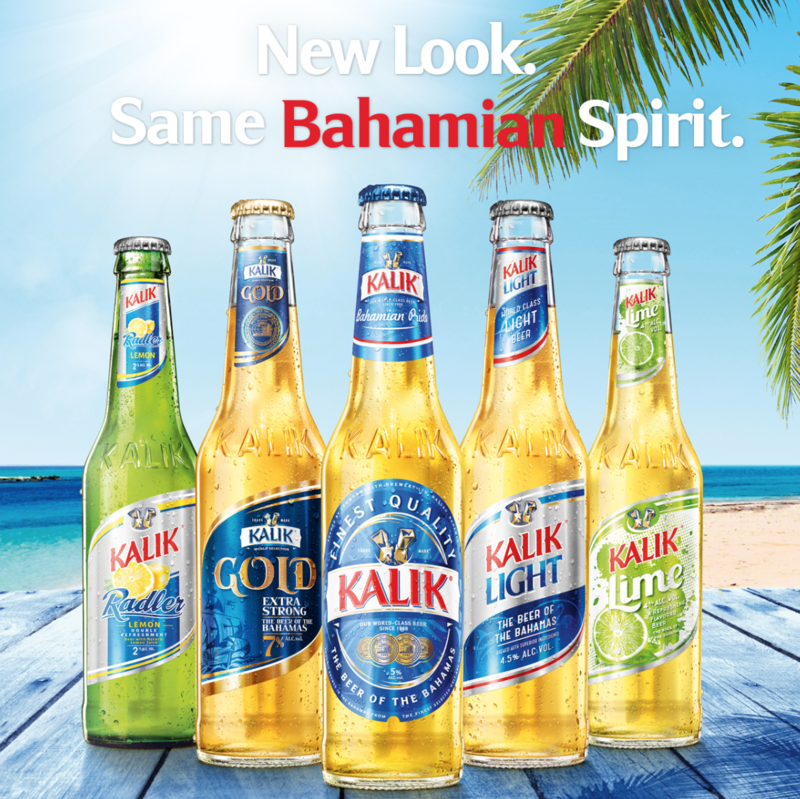 Kalik far and away out sells all other beers in The Bahamas including imports from Eurpope and the US. So pick up a 6 pack or a case next time you are in Exuma. Cheers! We are fortunate to have a wide choice of wines in our Exuma stores. 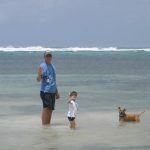 Surprisingly, for a small tropical island, the prices are not to different from those in the US. 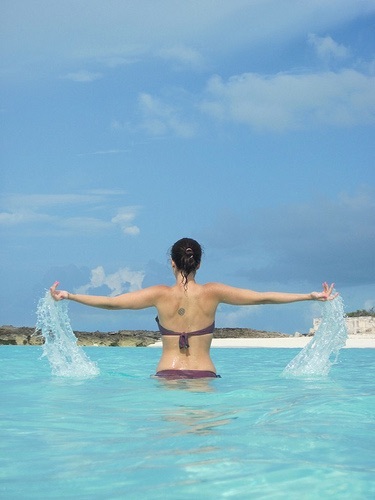 Most wine is sent to Exuma from the Bahamian capital Nassau. 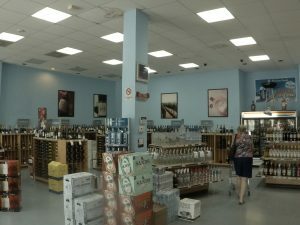 The largest selection is at Bristol Wines, a store located in a mall adjacent to Sandals Resort. Occasionally they have an open evening with wine tasting and that we make a special effort to attend. Their selection is not just California wines, they have a wide selection from Europe, from Australia and New Zealand and from South America. One of our current favorites is Pinot Noire from Chile.